Located in the middle of the St. Lawrence River, Grosse Île was a quarantine station for the Port of Québec from 1832 to 1937. At the time, the island was the main point of entry for immigrants coming to Canada. Thousands of Irish were quarantined on Grosse Isle from 1832 to 1848. It is estimated that over 3000 Irish died on the island and over 5000, many of whom died en route died, are buried in the Irish cemetery. Grosse Isle is the largest Irish Famine burial ground outside Ireland. It is estimated that between 1832 and its closing in 1932, almost 500,000 Irish Immigrants passed through Grosse Isles on their way to settle in Canada. The Lazaretto, built in 1847, where smallpox sufferers were treated and the Catholic chapel are still in existence. Irish immigrants who died of typhus in 1847.
engraved in this place of calm, peace and meditation. 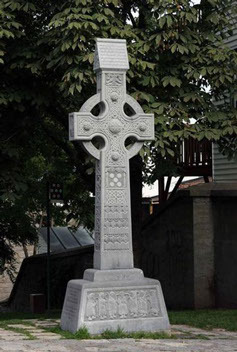 The Celtic cross that stands in Artillery Park on McMahon Street in Quebec City is the property of Irish Heritage Quebec. The cross is a gift from Ireland to the people of Quebec in memory of their generosity and compassion during the period of the Great Migration of the 19th century. The Cross was donated by the Irish philanthropist James Callery, founder of the Strokestown Park and Famine Museum in County Roscommon, Ireland. 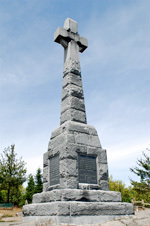 A recognized sign of Irish identity, the Celtic cross stands near what was the site of the first Irish parish in Canada. The monument is part of a larger plan to recognize and develop Irish heritage in Old Quebec. When a pier of the Victoria Bridge (1853-59) in Montreal was constructed on a Famine graveyard, an estimated 6,000 victims were relocated to a nearby area. 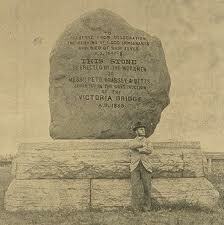 The largest rock removed from the river during construction was inscribed and erected near the Bridge by the Irish workers. This is believed to be the oldest memorial to Famine victims in the world. 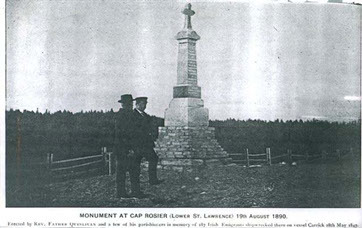 In 1900 the Memorial to the victims of the wreck of the Carricks out of Sligo was erected at Cap-des-Rosiers parish church. Later, in 1966, the ship’s bell was found far away in Blanc Sablon and enshrined in a small monument next to the original one. A plaque, put in place in 1977 by the Canadian Parks Service, is located in the north sector of Forillon National Park.